If we are aware that people are shaped by cultural events and the advances in our modern world, then why do we judge the next generation so harshly? We think that the way we lived is the right way, and it is the best way to experience life, but the fact is: those days are over. Change happens over time. We look back and are happy about how far we have come, but it is almost like we live through these changes without thinking about how it will affect the next generation. It isn’t until we see the effects that we begin to question our practices… should our societal changes matter in how we educate the youth? I think the answer is yes. 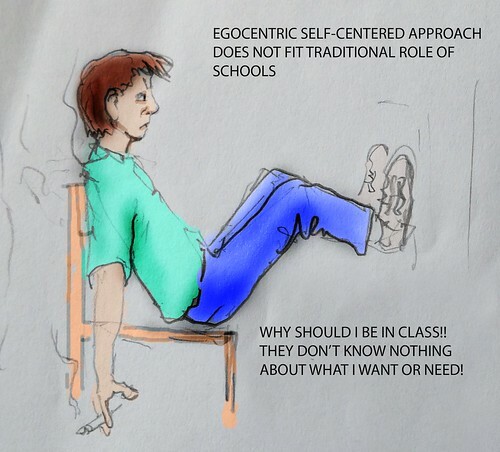 Educators, bosses, and parents alike complain about the future generation. They say things were handed to them, they are entitled, they do not know how to work, but we teach in a system that promotes this. We allow students to hand in things without deadlines, push them along, and tell them it will be okay in the end, heck, we make it so it is okay in the end. But we need to stop complaining, and start teaching these students how to be more independent… but the answer is not going back in time and teaching students the way we were taught. We need to consider the world around them and make it a safe, and happy place for them to succeed. Schools need to adapt to the world around them. I am fortunate enough to work in a school that allows me to teach interest based education. My students are interested, come almost everyday and tend to work harder on assignments because they enjoy what they are learning… but all education needs to be like this. A large part of this change needs to include technology. As educators and parents we need to educate the youth to critically think. It is easy to Google an answer, but we need to be able to understand how to get there, and what do do after. In the article Digital Citizenship: The Critical Call to Educate and Prepare 21st- Century Learners they talk about using technology to improve the lives of our students. We need to learn how to “leverage technology for the best possible outcomes.” As the job markets change we need to prepare our students. The article goes on to explain that in the future”3 million jobs will be vacant due to lack of required skills and technological exposure.” Just because educators are not comfortable using technology, does not mean we do not have to change for the benefit of our students and prepare them for their futures. When we teach our students the skills to use technology, we must not forget about their well being. Educators need to teach students how to communicate properly within their online communities, and how to use the internet safely. Digital Citizenship is such an important aspect for students to understand. It goes beyond just bullying. Students need to understand the Nine Themes to Digital Citizenship including Literacy and Etiquette, and as the article (Digital) identity in a World that No Longer Forgets points out, we need to ensure that students understand that their context/audience, authorship and their empathy matter while they are online. In my classroom alone I see a need to teach Digital Citizenship. My students use email addresses like buttmonkey69. I see their inappropriate Snapchat’s on our school’s geo-filters, hear about the videos they make and the comments they write under their friends posts. THEY CANNOT PROBLEM SOLVE. If we continue to ignore these problems and chalk them up to kids being kids, it will be too late. The internet is forever and their online identity could harm them in the future. As educators, we need to recognize that students need to be taught these lessons in school. We need to prepare our students to get jobs, to be good people and most importantly, prepare them for their world. I like the idea of using tools like the Nine Themes and Graphic Organizers like in The Definition of Digital Citizenship. They allow learning to be fun and easy for our students instead of scolding them for their behaviors. We need to take this to their level, and make sure they really understand the importance of Digital Citizenship. I think education is what you make it, and we need to make it beneficial for students. Previous Post Does Technology Hurt or Help? Amy, I also think we need to teach our students to become more independent and that we cannot do this by following the way we were educated some years ago. I wish we could have more courses like this one that challenges us to rethink education. I don’t have an answer for this issue, but I am willing to be part of the discussion! I really enjoyed reading this post, Amy. I love how you’ve prioritized teaching kids about communication in the online world. If we think back to our basic lessons about feelings and communication when we were young, it all made sense. Role plays of saying particular things to people face to face allowed us to dramatize emotional responses to those around us. The old “trust” game where your friend would lean back and you had to catch them reminded us of the importance of being loyal and the value that came with trusting those around us. These types of things can’t be communicated as easily in an online context. Loss of trust, hurt feelings, and regretful behaviors are far more likely to occur in the online world than face to face, and it’s certainly our job as educators of future digital citizens to keep this in mind! While I also agree with your comment about many students lacking problem solving skills, I will say that I’ve experienced them being far more able than I to problem solve when it comes to technology :).